It was not a great day for Texans quarterback Deshaun Watson. Watson had done a great job taking care of the ball over recent games but had a couple of turnover-worthy plays this afternoon. Watson was also unable to hit any downfield throws to get big chunks, and the Texans settled for too many field goals as a result. Part of the reason for the Texans’ offensive struggles was the inability to get DeAndre Hopkins the ball. Hopkins did score Houston’s lone offensive touchdown but was limited to only five catches on the afternoon. How do you put a stop to one of the league’s most conservative passing attacks led by one of the NFL’s most disciplined signal-callers? The Texans submitted their answer, and the results speak for themselves; they got after the quarterback and regularly moved him off his spot. The quartet of J.J. Watt, Jadeveon Clowney, Whitney Mercilus, and D.J. Reader combined to topple Washington’s offensive gameplan. The strategy kept the combination of Alex Smith (who left the game with a serious lower leg injury) and Colt McCoy to less than 200 yards passing. J.J. Watt was a disruption to the run game, he collected a pair of sacks and most importantly, he came away from the game in full health. Mercilus and Clowney also managed to tally a sack apiece and Clowney proved to be nearly unstoppable when lined up between the tackles. This is a defense with significant playoff potential if the major pieces can remain healthy the rest of the way. Alex Smith did not play his best game and left on a cart during the third quarter. All due respect to Smith after the injury, but he would have had a passer rating in this game if he had simply thrown the ball into the ground on every passing attempt. 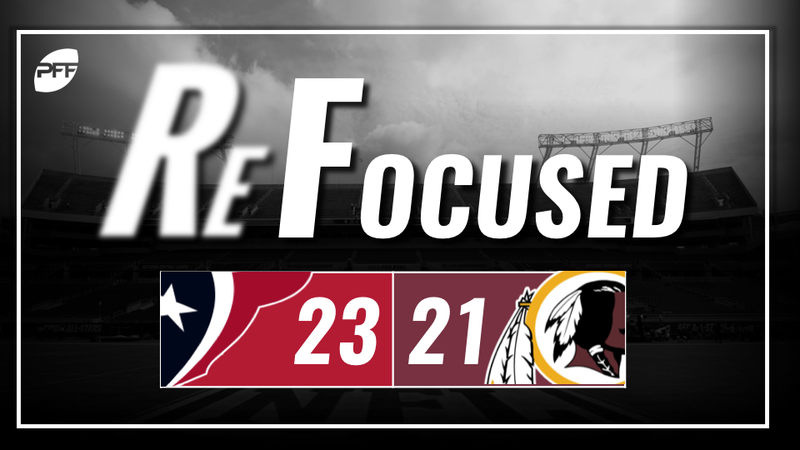 Only one of his two interceptions on the day can be blamed on Smith, as Houston’s pass-rush led to a miscommunication with tight end Jordan Reed that resulted in a 101-yard pick-six by rookie safety Justin Reid. Tight End Jordan Reed came alive in the second half following the injury to Smith. He connected with Colt McCoy on an out in the red zone to bring the Redskins with three points. Reed finished the day with 71 yards on seven receptions and simply must continue to be a major factor in the passing game. The key matchup of the day was Josh Norman on star wide receiver DeAndre Hopkins. Although Norman did limit Hopkins’ catches, he did give up an early touchdown to him and was also caught committing holding penalties that extended Houston drives. Daron Payne had the best start of his young career on Sunday against the Texans. Although the Texans were somewhat effective on the ground, their success was limited to the edges, as Payne overwhelmed center Nick Martin in the trenches in run defense. Houston: The Texans defense was able to bail out one of DeShaun Watson’s worst starts of the season. Washington: Despite the late comeback attempt, the Texans’ fierce pass rush ruled the day.